Son of Fred and Sarah Edmondson, of 8, Banks St., Briercliffe, Burnley. The parents of Pte. Joe Edmondson, residing at 8, Bank-street, Briercliffe, have been informed of his death in hospital in France as the result of gas-shell wounds. Last week they received a telegram summoning them to France to see him. His mother was on her way to France, but on arriving in London she got the information that he was dead. Pte. Edmondson was joined to the South Wales Borderers, and was 19 years of age. He joined up at 16 years of age, but was reclaimed by his parents. He re-joined, when 18, on March 5, 1917; was trained at Kimnel Park, Wales and went out to France towards the end of 1917. He was in the trenches by December 25. He was employed by the Hill End Mill Co., and attended Haggate Independent Methodist Church. His father, Pte. 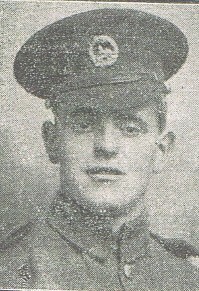 Fred Edmondson is serving in the South Lancashire Regt., and has been in France close on twelve months. We deeply regret to record the death of one of our scholars. Joseph Edmondson, who died in France on May 23rd. He joined the colours at the age of 18, and trained with the South Wales Borders. After ten months' training he went to France and went into the trenches on Christmas Eve last year. He was a good worker, both at home and in the church, and was a member of the choir for a few years. Our deepest sympathy is extended to his parents and friends in this dark hour.